The idea behind Wall Street Coin is to offer a Peer-to-Peer Blockchain-based Stock selling and investing platform open to everyone. The platform will be based on Blockchain technology and Smart Contracts, functioning as a Decentralized Stock Trading Platform. To ensure correct stock shares evaluating, avoid fraudulent stock sales and other potential threats to investors, every company listed for public stock sale on our platform will undergo a background check by a team of financial experts. The current Stock Exchanges are all based upon centralized platforms. Counter to that, Wall Street Coin Platform will be based on Ethereum Blockchain technology, offering full transparency and all-time log of all the trades ever done within the platform. 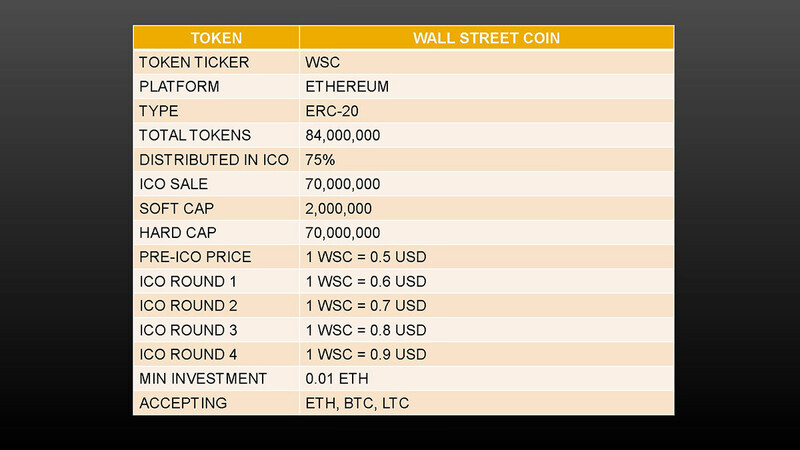 WSC platform will organize and systemize the stock market, bringing stability and identity verification, transparency, security and trust to a traditionally insecure stock market. 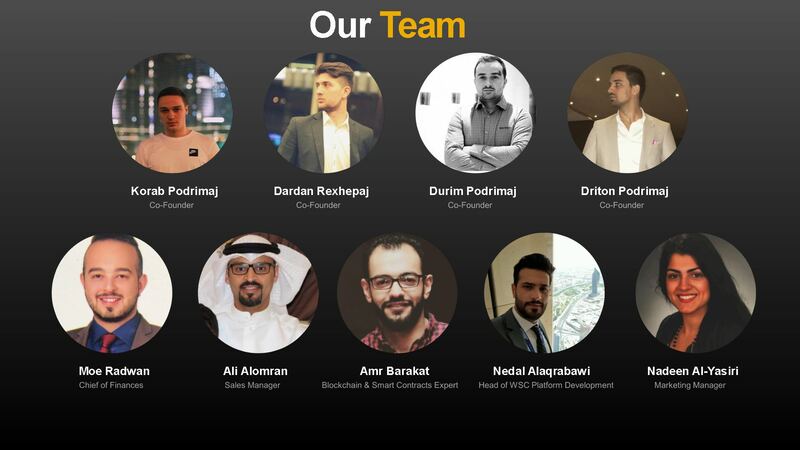 We aim to create a marketplace for the users, where they will be able to operate within a robust and resilient Peer-to-Peer network without having to pay a fee to middlemen, thus, allowing them to avoid deceitful stock selling campaigns and invest directly by themselves on startups or businesses of their interest. By making use of the Ethereum Network Blockchain, Wall Street Coin ensures the transparency of every stock investments and their complete security. As of now, the brokerage firms possess a massive amount of economic and political power which is growing exponentially as a result of the centralized system they have developed to operate in. A major problem of this centralized system is its vulnerability, which brokerage firms have leveraged upon to manipulate the value and prices of shares and other conditions in a way to magnify their profits at the expense of the investors. With our Wall Street Coin network algorithm, we will change this by allowing companies with great expansive ideas to a greater chance of selling stock shares of their companies, with accurately and legit valued prices, to customers with suitable budgets and interest. 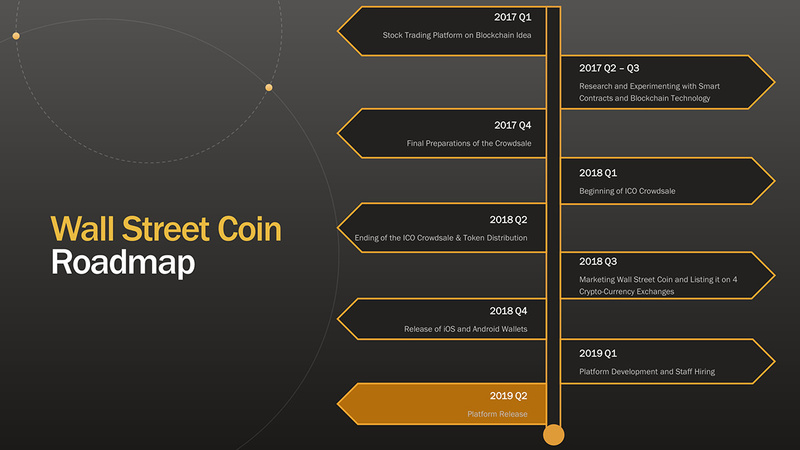 The Wall Street Coin Platform seeks to procure solutions to the several challenges facing the stock market. We make full proof of the smart contracts feature of the Blockchain technology which is particularly suited to organize and systemize the stock market thus bringing stability and identity verification, transparency, security and trust to a traditionally insecure stock market. There are a lot of issues plaguing the Stock Market and most of these issues revolve around the fact that the Stock Market runs a centralized system of exchange. There are a lot of disadvantages this system of exchange has brought to the investors as they are not catered for at all. The stock brokers and the companies are usually the benefactors of the stock market all at the expense of the investors. The truth is rather than the market serves the purpose of allowing the investors make profit, the companies and their agents are usually the profit makers. Thus, the customers are usually faced with mistrust, waste of funds, insecurity, capital loss and fraud. The presence of a middleman has brought a lot of mishap to investors as most of the time these investors are usually after enriching their pockets and not the investors themselves. This has caused loss of capital and as such, so many individuals are scared to invest in the Stock Market. 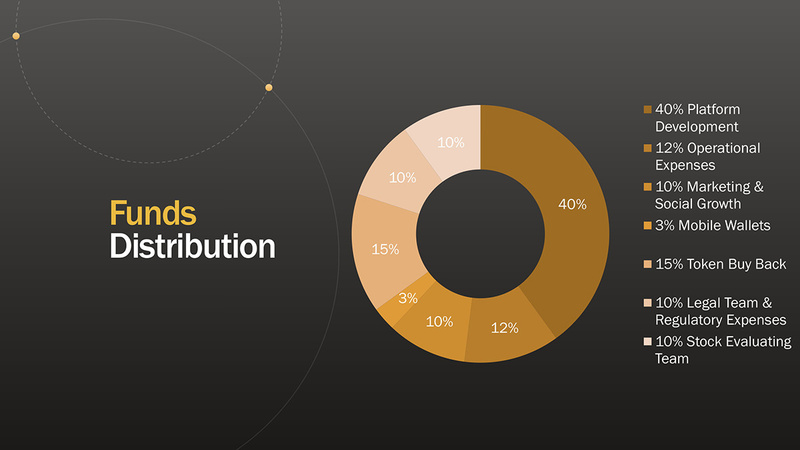 In essence, these middlemen are in charge of tracking share ownership and also accessing the official shareholder list and as such, money is usually at the helm of the middleman. It takes three days or more to complete a transaction usually because of the numerous intermediaries involved in the process, regulatory processes and even the operation trade clearance. This tends to leave investors at risks as immediately there is a delay in the recognition of the owner, the system most times do not get to recognize such transaction. Instance arise in which Stockbrokers hijack the funds of an investor. This is very possible because most times, they have access to their clients account. Sometimes, they could divert the fund in bits until they are in total control of the money. Some other times, it could be external hackers who would hack in into an investor account to take full possession of the account. Most investors no doubt get to lose a lot of their money often as a result of the wrong information given to them by stockbrokers. Since brokers make more profit by trading more, they sweet-talk customers into trading even when they know the market is not favorable. At the end, they make gain at the expense of these investors through the commissions they get. This is loss on the part of the investor. The tasks involved in completing a transaction is herculean due to the numerous processes and as such, there are usually so many intermediaries who clear trades, some hold assets while others keep records. Every one of these intermediaries are definitely going to charge a fee for their service and as such, it reduces the investment power of the investors. Aside of this, the processes are usually just too complex. An investor cannot just decide to do all of these tasks himself. One way or the other, he needs the services of the stockbroker. As a result of the complex process involved, it is usually nearly impossible for investors to think about going offshore with their investments. As a result of the centralized system of the stock market, information is usually held on a singular server and as such, it is usually open to hackers. The lack of transparency thus breeds mistrust and fear among investors. The amount of money paid out as commission to stockbrokers by investors is usually discouraging. As a result of the numerous intermediaries, commission associated with them as a result of services they render like record keeping, auditing, verification of trades is usually exorbitant. 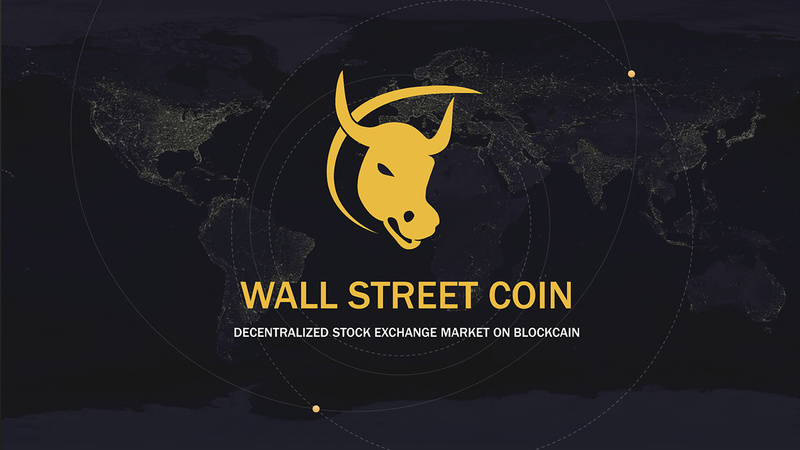 The Wall Street Coin is targeted towards solving the Stock Trading Market problems through the decentralization and automation of stock exchanges. These therefore would eliminate the presence of a third-party as every of the process would be handled by the smart contract itself. The following are solutions which the Wall Street Coins will provide. The Smart Contract does not depend on the presence of a middleman whatsoever. It is self-independent and as such, it deals away with any bias whatsoever. There is the encryption of all document on a common ledger which allows every party to have open access to them. This produces trust in the mind of clients. There is little to no risk for the platform to become a prey of hackers as a result of the high level of encryption involved. The smart Contract handles every process independently and as such, it deals with the monotonous stress accompanied with humans. This thus make transactions easier and faster. There is openness with the use of smart contracts as everyone can see the transaction as its being made and follow up on it. Wall Street Coin aims to eliminate the payment of any commission whatsoever. The smart contract is going to be responsible for every process. As opposed to the natural presence of a middle man for handling of processing, the Wall Street Coin aims to provide the Stock market with a decentralized system in which every one on the platform can see every transaction that takes place. More so, a decentralized system eliminates the presence of complex and time-wasting processes. All that would be needed by the investor and the company is verifying the transactions as they occur. The Wall Street Coin thus would enable a peer-to-peer relationship between customers and companies directly. Due to the decentralization of transactions, the Wall Street Coin Platform offers a faster and more efficient means to transacting. It eliminates the numerous intermediaries by using the smart contract as an alternative to process transaction better and faster. Therefore, this solves the problem of exposing the investors to risks. Through our platform, the company can upload firsthand information which then will be evaluated by a staff of experts of this field. After the evaluation, it will become public for investors to see, so as to make the right decision as where to invest. This eliminates the fraudulent practices of middlemen who just in a bid to enrich their pockets give wrong information. Due to the ease in transaction, investors have the chance of investing in different companies around the world. This is made possible by the Blockchain technology as it handles the issue of long processing of transaction. 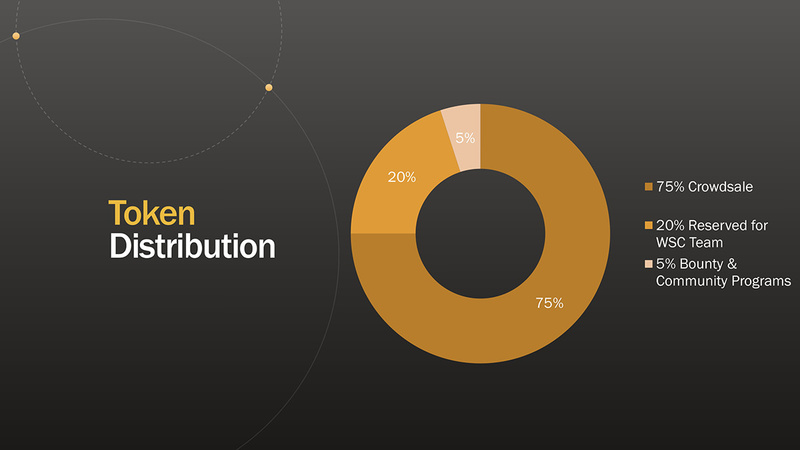 We are running a Referral Program where we reward WSCOIN.IO members 5% of all orders that are done using their Referral Link. You can share that link, and when people join using your Referral link and they purchase tokens, you will be rewarded 5% of the total amount. You can share your link in person, via social media, forums, videos, messaging services, email or any other way you choose to communicate with. I think there is a 35 percent discount for shuan. I think it should be evaluated. beside of the normal purpose " Peer-to-Peer Blockchain-based Stock " to avoid another fee for investment and so on.. Are there any special option that will make wall street different from a bunch of thousand coins out there. An interesting idea and I hope the project will take place, sounds quite promising. Peer-to-Peer network without having to pay a fee to middlemen, thus, allowing them to avoid deceitful stock selling campaigns and invest directly by themselves on startups or businesses of their interest. Yes, that's a great advantage of the project. Devs, is it necessary to use your wallet or any ETH can be used? Very nice and well planned project. Reflects a team with great brains.. In a nutshell,the vision of this company is to give power back to the decentralized system users enabling them to set their own prices within the framework of a very much flexible market operations. This is good as it avoids the presence of complex and time wasting processes. The Wall Street Coin ecosystem project based on ethereum platform, a very interesting concept of this project. a very attractive whitepaper with great team and a roadmap plan this will be a big project.